this flag enables the shell commands. Export worksheet(s) to supported formats. SMathStudio_Desktop.exe -silent -e .smz worksheet.sm "worksheet 2.sm" "worksheet 3.sm"
Provide a flag to display current SMath Studio installation details. Specific context options. Usually used on export. This flag may be used in some specific file-export plug-in to enable options from command prompt. Initiate printing of the worksheet(s) using specified printer. Set "default" to use system default printer. SMathStudio_Desktop.exe -silent -p default worksheet.sm "worksheet 2.sm" "worksheet 3.sm"
Perform testing of the worksheet. Testing allows to verify that all calculations in the worksheet are returning the same results as last save and no new errors appear. You can even specify a path to tests all the worksheets contained into a folder. 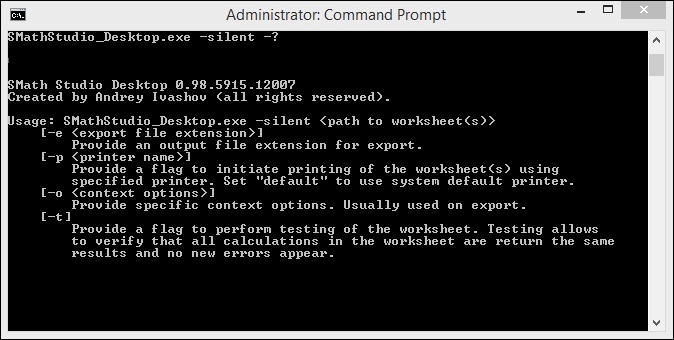 SMathStudio_Desktop.exe -silent -t worksheet.sm "worksheet 2.sm" "worksheet 3.sm"
Provide maximum time in milliseconds (ms) to wait for calculation of a single worksheet. Calculation will be aborted if this time limit exceeded. 1 hour is set by default.